Despite already having an expensive Dell FPW2405 24” panel and a CiBox 22” next to it, I still cannot get enough space. I’m a massive multi-tasker, almost constantly running VM’s or remote support sessions either for my own company or working on behalf of one of our clients. 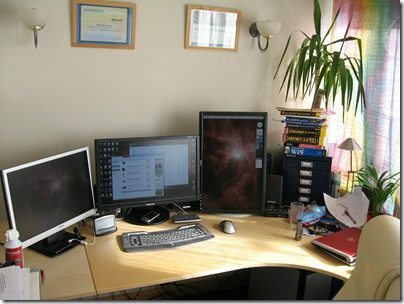 I could easily use as many monitors as I could put on my desk. I know what some of you will be thinking, “What’s he doing purchasing more stuff during a recession?”. The answer, if you didn’t already know, is, “Evolving”. As the economic climate gets colder, it’s worthwhile if you can, to take the jump and invest a little in your own productivity now, while prices are low. 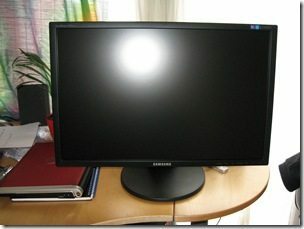 This new Samsung 24” can be had for around £200; consider how long you spend in front of your monitor and how important it is to you. If cost is a consideration, take one day less holiday this year and give your eyes a treat all year round. Who knows, you might be more productive and able to bill more, or write more software and make up the difference. Anyway, back to the monitor. It replaces my current main monitor in the middle of my desk and my old main monitor gets rotated 90 degrees to be in portrait mode. This is ideal for writing documentation, lengthy blog posts, or coding. I can’t wait to finish this article, get back to work and not have to scroll up and down to review code. Now that I’m not compromising on vertical screen real estate I’ve added all the sidebar widgets I could think of. Weather, RSS feeds, messenger, Chipr (a twitter widget), calendar, clock and I still have about 900 pixels left. The reason the more expensive Dell is on the right in portrait mode is because it’s the only panel I have that isn’t a Twisted Nematic (TN). The Dell is an I-PVA panel, which is a more expensive technology for panels. The Dell is capable of displaying true 32 bit colour sources without resorting to high tech trickery, and it also has an unbelievably wide viewing angle whereas the two TN panels need to be observed from straight on. This is not a problem for the Samsung which uses a new modern TN panel, but the Chinese-made CiBox panel is particularly poor at wide aspect viewing. Ironically, Samsung also make the panels for most of Dell’s monitors so the Dell in a way, is a Samsung monitor with a Dell badge. If you want to know how this setup is working for me, get in touch with a comment at the bottom of the article. I’ll be making a separate post later on running Radeon 4850’s in Crossfire as that’s what I’m doing at the moment to power these monitors, but Crossfire is temporarily disabled until my new Antec Neopower “High Efficiency” 550 Watt PSU arrives within the week. I bought these from eBuyer (I have two now) for £200 ex VAT, add on the VAT it becomes £230 or so.